I thought Doug Ford had entered the Ont. PC party race Eric?? He's mulling a bid, but it sounds like he will. If he does that will change things I guess ?? And after the Hudak disaster whoever gets the Ont PC Party has more than got their work cut out trying to overcome the situation. They've chosen the wrong leader four times: a hesitating Ernie Eves, a weak John Tory, Tim Hudak and Tim Hudak again after the 2011 defeat. To top things off, they surrounded them with incompetent party operatives who proposed the wrong policies in the wrong places: budget release in Magna, funding of faith based schools, chain gangs/foreign workers, and then firing 100K people. Bad leaders and bad operatives. The Ontario CPC is running off the Federal LPC book with weak leaders (Martin, Dion, Ignatieff) and bad operatives (whoever selected Martin, Dion and Ignatieff). Agree in spirit with the comment but its quite possible party members in these cases are selecting the best from a set of leadership hopefuls at the time, who only prove themselves to be poor unsuccessful leaders down the road. Obviously no party membership elects a person who they think will lead them to defeat. Obviously no party membership elects a person who they think will lead them to defeat. First, what it takes to win the leadership in back room politics is not always the same as what it takes to win an election (ask Mr. Deb Hutton). Second, there are parties which attract personality types that do not wish to govern. The NDP and the Greens are good examples of this. If you think about it, this is a self selection process. If you really want to effect change you are better off joining a established party and reform it from inside (Blair, Clinton, Gorbachev) that putting your eggs in a perennial third/fourth place basket. Interesting that you are scrapping the bottom of the barrel for a topic when there has been a landmark election with Canada's largest trading partner where the pollsters were off by a significant margin. 538 Nate Silver was able to quickly point out how the pollsters missed it and were 4% bias towards the Dems. The Republican take over of the Senate will mean that Keystone will be approved.... that will likely have a larger impact on Canada and Canadians than say the Toronto Civic election. Not only you Eric but basically the whole of Canada's media seems willing to ignore major stories that have a huge impact on Canada if it is not generated out of Ottawa Toronto or Montreal. This is a site about Canadian polling. Others can and have covered the US midterms better than I could. Keystone is not a done deal yet and a Republican Senate does not significantly alter the obstacles. 1.The project still needs approval from the US State Department lead by a Democrat. 2. Many landowners whose land would be crossed by Keystone are opposed. This may well lead to multiple court battles whose outcome is far from assured. 3. Falling oil prices make Keystone less attractive to Americans and American oil refineries than a few months ago. Today there is a glut of oil on the World market when Keystone was first proposed there was a scarcity of supply. The whole idea of energy independence for America is mute nowadays-America is energy independent so much so that the Saudis are lowering the oil price. Frankly there is not as much need for Keystone compared with a couple years ago. I would go one step further in response to BCVOR's overconfident statement about Keystone XL. In essence, the legalities indicate that it is indeed a State Department decision but in the world of practical politics, it is actually a disguised presidential decision. In short, Obama will keep whistling in the wind until his term is up. As for the next Prez, anything goes from a Yes, a compromise, to a definite No. One should also remember that while 52 seats is a majority in the US Senate it is not an effective majority due to various procedural rules that require a super-majority of 60 votes. Seems like you have some anti-Eastern sentiments. Ottawa is the capital city of the country. Toronto and Montreal are the two largest cities in the country. That might be one of the reasons why you hear a lot about them. The Toronto municipal election was more widely covered this year due to the Ford phenomenon. I'm sure there would not have been the same level of interest the Fords didn't exist and it was just Tory vs Chow. 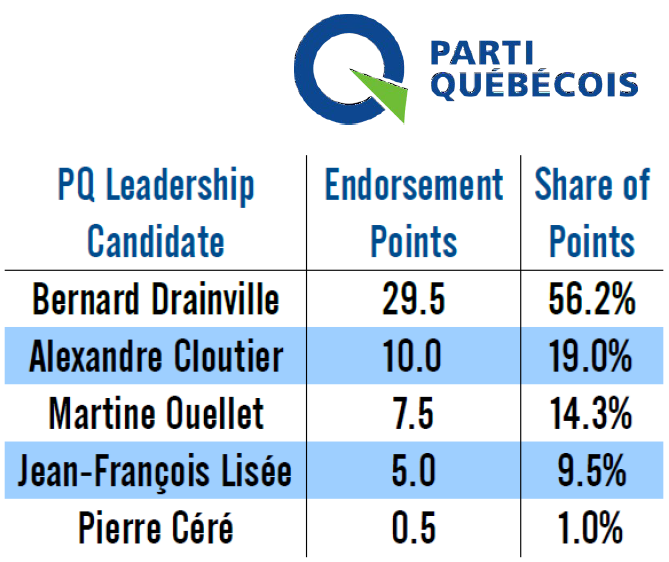 I believe the leadership races of the Ontario PCs and Quebec PQs are important for a political site such as this. Both opposition parties are in peril and these races will determine the future of these major political entities. The US election where the winning parties first commitment is to push through something that is key to Canada's economic well being should be covered more. Balancing budgets, paying for Montreal's bridges and Toronto's transit depends to a huge degree on Canada being an energy super power. As well the model for all our pollsters and reporting on the polls and even the basic premise of 538 web-site being a model for this web site should not be ignored. @Eric I do not want an analysis of the election itself but how the polls were 5% biased to the Dems and how 508 reported on this. Is this the model you want to adapt to .. or do you want to continue with your normal explanations after bad polls that the electorate changed its mind in the last minute? Turnout was 37%. At that point, it becomes all about who turns out, which is a tricky thing for the polls. That the polls missed a midterm call, as Silver pointed out yesterday, is about as likely as it was not. Polling bias to election outcome, not sure bias is the right word, error is better...but it varies a lot from year to year in the senate predictions. Nothing stands out this year as anything really outside of the ordinary, some years are closer to reality some years are not. What model are you proposing exactly, ignore polls and go with gut feeling?....if anything 538 did a great job on predicting the senate race outcome even with the error in the polling data. That's the important point too I think. As Nate Silver pointed out, you can't actually predict in which direction and by how much the polls will be biased with much certainty. It is debateable that Keystone is critical to Canada's economic well being. If oil prices keep falling, at the moment that looks to be the direction, then Keystone XL will not improve matters because Keystone will increase supply and lower the price further. One could argue that Keystone is detrimental to Canadian interests because it pushes down the price, that makes many Alberta and Saskatchewan wells unprofittable. Secondly, Keystone starts in Alberta but traverses great swaths of America where fracking has made oil production a reality. Keystone XL doesn't just improve Canadian access to US refineries it also improves Montana, Oklahoma, South Dakota, Nebraska, Kansas, Missouri, Illinois oil access. Indeed, storage facilities will be constructed along the American portion of the route in order to store Canadian bitumen and give American oil preference. If Alberta had any sense they would have constructed oil refineries decades ago like Lougheed envisioned. Unfortunately, they haven't. Alberta should do the right thing and give their sub-surface resource rights back to their original owner Canada. Unfortunately, it's not quite working as intended - the lower ruble means that Russia's receiving about the same price as before the price drop, in rubles. Please, enough with the conspiracy theories. The Saudis are opening the taps so to speak to preserve market share, it has nothing to do with Russia. They simply want to preserve their own interests since, fracking is cost prohibitive, the Saudis hope to interript or bankrupct many American and Canadian fracking operations thereby reducing domestic supply and preserving Saudi market share. Low oil prices don't hurt the Saudis since, their oil is easy to access and costs are relatively low. There is the unintended consequence that the Saudi policy hurts Russia but, Russia is a bit player in the whole scheme of things. Russia also has very high costs, the BBC stated $104 was the approximate Russia break even price. I think McNaughton's ranking is overstated due to his endorsement by three-time winning MPP Bob Bailey, which apparently has more clout than four MPs endorsing Brown. 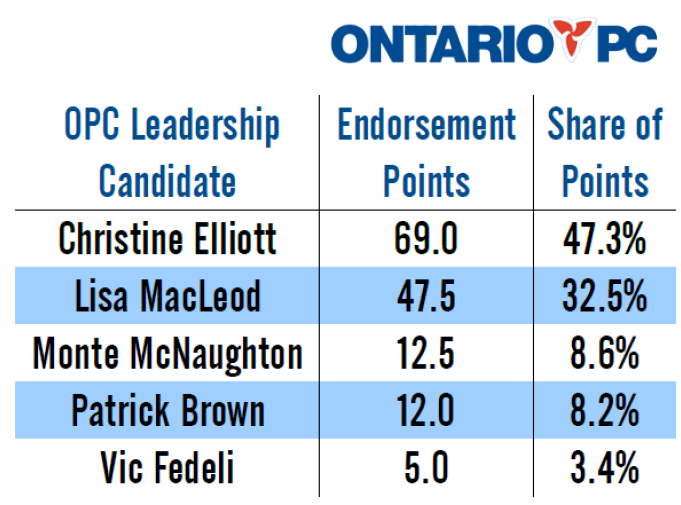 Right now it seems like the race is between Elliott, MacLeod and Brown. Elliott is the front runner, but I could see the party's right flank maybe gathering around a single candidate to beat Elliott. If Doug Ford enters the race, I feel Elliott would benefit. There could be an anybody but Ford movement that propels Elliott to win the leadership. At this moment, I feel the PCs should play the long game and silently acknowledge that their new leader may not be premier until 2022. If the Liberals weren't beaten in 2011 and 2014 when they were weak, they will be tougher to beat in 2018 when the conciliatory Wynne continues to make amends with center-left and centrist voters. Which still doesn't Carl, make the second Hudak election in the least sensible !! Having lost the first election his credibility had to be really low. I do remember quite a battle before he got the second chance and all I'm going to say is the Ontario party fubarred !! And easy to say in foresight. I read the numerous online comments on the Globe and Mail, National Post and the Toronto Sun in the days after. They were nearly universally against it regardless of party affiliation. Many leaders lose their first time out. But if they increase their vote share and or gain seats from the previous election they are likely to remain leaders. There are countless examples of this, from Gary Doer in Manitoba, to Stephen Harper who lost elections before they won them. Not to flog the point, but Hudak increased the vote share of the PC's in 2011 by 3.8% from the previous 2007 campaign, with the party gaining 12 seats to the liberals losing 17. Some folks would likely say he should have won that election, but he did make progress over the previous showing and would likely convince the parties membership that another crack it would lead to victory. It may be easy to say in hindsight, but as PolStats points out, a lot of us called in beforehand too. It was painfully obvious from my standpoint at least that Hudak was a poor choice in leader. I'm sympathetic to giving a leader a second chance, but not when it's painfully obvious that the leader is the primary reason for a defeat, and a continued drag on the party. Stephen Harper never blew a 15% lead in the polls btw. Every leader gets two elections-that is the rule of thumb in Canadian politics. Some leaders resign after only one defeat but, most remain to fight another day. Even leaders such as Carole James who ran two poor campaigns are accorded this "luxury". It took a caucus revolt (not a party revolt) to topple James. James is a good example of why you keep leaders, it takes a certain familiarity to be elected premier and replacing a leader means building the branding exercise all over again. It is not uncommon for the majority of the public to not know the name of the Opposition leader during his or her first election. The crux of the matter is no matter how "good" or "poor" a leader may be perceived to be the next leader will have faults of his/ her own because nobody is perfect. The other point is there is no perfect mechanism for choosing a leader; one member one vote, delegated convention, appointment or a third method have produced failures. So basically the odds favour sticking with what you and the public know and that usually means the incumbent. In hindsight it is clear to me Liberals should have elected Bob Rae in 2006 but, my conclusion is based as much on the 2011 Iggy election as the 2008 Dion election. Rae also had a litany of negatives and it is far from certain he was would have been able to produce a government in 2008. Hindsight is a strange phenomenom. On paper Darrell Dexter was 1/4 in elections but, the 1 was a historic win for the NS Dippers. Jack Layton was 0/4 in general elections but, like Dexter he was able to shift the electoral paradigm, albeit perhaps only temporarily. Dion was not afforded a second chance, though I think he could've done better next time around if he had been. He had a lot of good qualities (honesty, integrity, a coherent vision) and was a real contrast to Harper, in contrast to Ignatieff (who had a history of political opportunism - supporting whichever politics are considered "in" at any given time - and had supported the Iraq war). It is true that lots of Canadian leaders are awkward during the first election and do better in a following one. McGuinty comes to mind. What was perhaps unique about Hudak was the sheer size of the lead in the polls that he had blown in his first election. I think it was his treating voters like complete idiots, rather than his conservatism, that was so disliked by many. He gravitated toward policy ideas that idiots would find easy to remember. Like the chain gangs. Or the fact that he seemed to pick an arbitrary number of 100,000 people to fire just because it was a simple round number. The fact that the math in his "million jobs plan" (yet another round number) was completely off, yet he refused to admit to it even after everyone else had. He was like Mitt Romney in his shameless lying, and never figured out that the tactics that work for the Republicans in the US don't work in Canada. Harper's figured it out, at least. You can't just shamelessly lie to people's faces in Canada like you can in the US; you have to obfuscate and misdirect, and always have several committees and reports to hide behind. And then blew it massively in the recent election. Sorry Hudak never really was a good choice ! See you are now getting air time, at least on Power And Politics, well done !!! "Bill Davis endorses Christine Elliott for Ontario PC leadership "
Thanks, but, we all have access to the internet where newspaper headlines are widely available. Some of us even pay money to read the Globe on line and frankly, you've just ruined the surprise.